Vintage stainless steel Swiss made Wittnauer wrist watch. 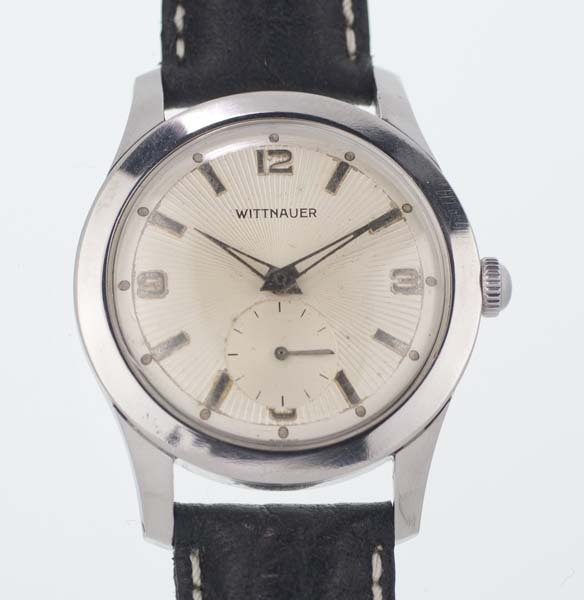 A Wittnauer wrist watch from the mid 1950’s, a period when the company was making respected watches in Switzerland. 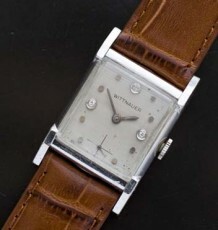 The Wittnauer Company had been allied with Longines during the early part of the 20th Century and was later moved to a Hong Kong based manufacturing company during the 1970’s when most mechanical watch companies fell on hard times. 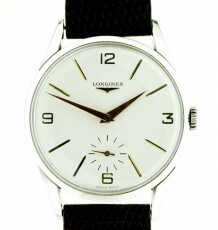 The watch is a classic 1950’s design with the sub-seconds movement and period correct original dauphine hands. The dial is a great eggshell colour with a radiant sunburst pattern textured into the dial. The hour markers are the now iconic Explorer style pattern of Arabic numerals at the 3, 6 and 12 o’clock positions. 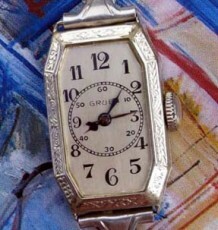 This model uses a movement made by Revue, a company founded in 1853 by Mr. Thommen. Watch collectors will recognize the name Revue Thommen as a Swiss watch and aviation instrumentation manufacturer. The inside of the case-back is signed Wittnauer Swiss watch company and is unusual as it is a recess slotted screwed on model. The watch measures 34 mm wide excluding the winding crown by 41.5 mm long. 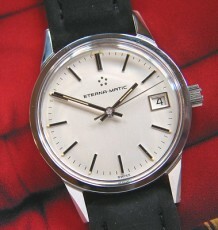 The watch will be supplied on the buyers choice of a black or brown strap.